There are many pictures that have to do with the Holy Week, [ Pilate washing his hands..] but also with stories from the Old Testament of suffering individuals and martyrs. The text is from the Gospel of St. John, chapter 18 [ here is the transcription of verse 28, pay attention to the many abbreviations!!!]. Adducunt ergo Iesum a Caiapha in praetorium. Erat autem mane et ipsi non introierunt in praetorium ut non contaminarentur sed manducarent pascha. This part of the Book is called: The Passion of Our Lord Jesus Christ according to John. *The firm of Thielman Kerver is best known for its lovely printed Books of Hours, many of which include hand-painted miniatures and initial letters. Thielman Kerver, who was one of France's most prolific printers of such books, began printing Books of Hours in 1497, and continued until his death in 1522. At this time, his widow, Iolande Bonhomme, took over the firm, and continued to produce liturgical books of different types until 1556. 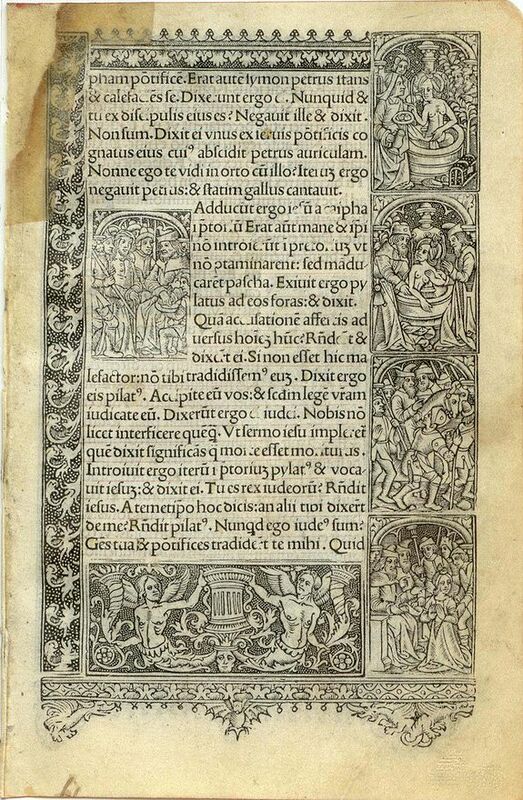 Brunet notes that even though Kerver printed many different Books of Hours, his work is less common than that of his colleagues, Simon Vostre and the Hardouins. Brunet suspects that is because fewer copies on vellum were printed, and paper copies were destroyed. This may also account for the rarity of the present leaf. Condition : One corner has an old restoration made with vellum.